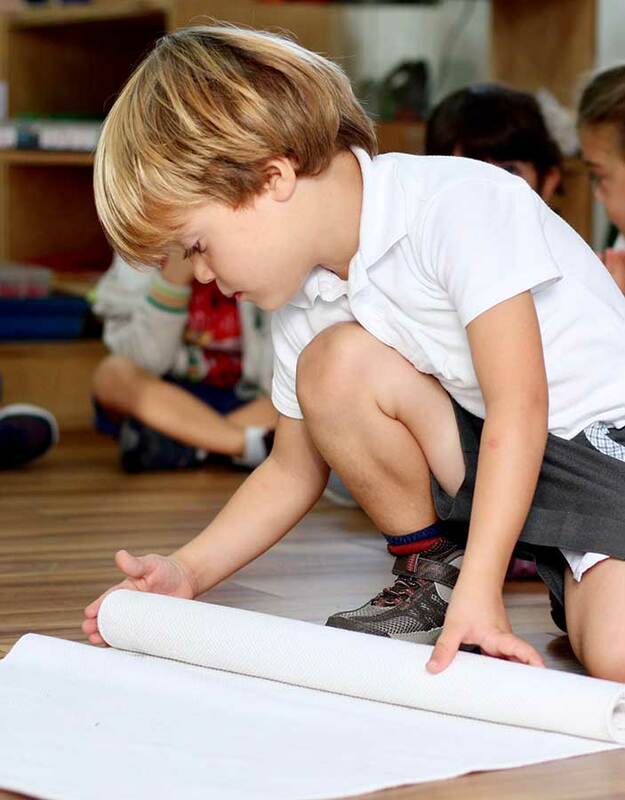 The Primary student’s journey begins in the Practical Life area, which serves as the foundation of the Montessori classroom. The activities in this area are often familiar and inviting to the child and tend to mirror some of those adults regularly engage in at home. In Practical Life, Montessori children strengthen necessary fine motor skills by working with their hands (and fingers) to complete various lessons that grow increasingly difficult over time. What are Practical Life skills? The Practical Life area is host to some of the classroom’s most appealing lessons for young children. It helps us learn how to engage in life’s most basic activities in a purposeful way. The purpose and aim of Practical Life activities is to help children develop order, concentration, coordination, and independence: skills that will follow them through their work in the rest of the classroom and life beyond. It is in the Practical Life area that children take their first steps toward independence and becoming more fully functional members of society at large. As a parent, you should expect your child to start trying to do things “all by myself” and without adult-aid or interference. Many argue that the most important work in the Montessori preschool may be a child’s Practical Life activities. Where Parents who are unfamiliar with Montessori education may feel that these activities are a waste of time (“Why is my child learning how to wash dishes when they should be learning how to do something more academic, like math?”), Teachers will argue otherwise. Math, reading, and language all require one to have the ability to focus, to be able to complete a task with logical and sequential steps, to concentrate, to make intelligent choices, and to see a task from start to finish. This is precisely the intent of the Practical Life activities. Through this work, children learn to go about their work calmly, with intent, and to take pleasure and satisfaction from their efforts. Practical Life activities can be categorized into four different groups: Preliminary Activities, Care of Self, Care of the Environment, and Grace and Courtesy. Preliminary Activities – These activities provide the foundation and set the stage for all works in the Montessori classroom. These include tasks such as how to roll and unroll a mat, how to walk around a mat, how to sharpen a pencil, how to carry a chair, and walking on the line. Care of Self – These activities provide the means for children to become physically independent. These include such activities as how to wash hands, how to brush teeth, how to pack a lunch, how to pack an overnight bag, and how to tie shoes. Care of the Environment – These activities may include how to set the table, how to clean dishes and cutlery, how to sweep the floor, how to dust the shelves, how to water the plants, and how to clean up spills. Grace and Courtesy – These activities are not found on the shelves. Rather, it is the Montessori Directress who introduces social graces and courtesies through everyday interaction. She guides the child in how to shake hands; say “Please” and “Thank You;” get someone’s attention; cough and sneeze; and be caring, kind, and respectful to others. Because Practical Life Exercises are meant to resemble everyday activities, the area is filled with materials that are familiar, real, breakable, and functional. Children will find shelves with trays designed for spooning, transferring, pouring, cleaning, and other common, day-to-day activities.